What we love about this colorful and bustling storefront is that it keeps our interest with new concoctions every couple of weeks. Check the tiny chalkboard for specials, but supplement with tried-and-true favorites such as housemade spicy fermented pork sausage, probably the best gang hung lay (pork in sweet, garlicky, ginger-laden curry) in town, and kua kae, a stir-fry of chicken, baby corn, eggplant, shredded lime leaves and roasted rice powder that has a gingery citrus tang. Vegetarian options abound. This is the closest thing to thai food from thailand that I have been able to find in Chicago - I will sometimes go out of my way (bc this is not anywhere near me) to pick up an order from this spot. The curries and all the appetizers are on point and many of the items on this menu you will not find in other thai places in the city. 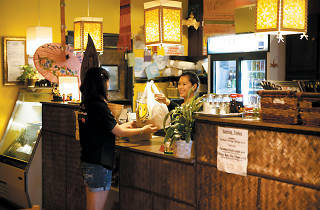 If you do sit in the restaurant, get a whole coconut for a drink and treat yourself to a mango sticky rice for dessert. You will not be disappointed. This isn't your average Thai food spot, as you'll discover after looking through the menu. The northern Thai dishes feature a lot of sausage, ground pork and egg noodles, accompanied by delicious coconut sticky rice. You can order the usual pad Thai as well, but you might as well try something new.